I love Spring! Living in Minnesota, the winters are long, and nothing is better than seeing that white stuff disappear! I don’t even mind the muddy mess or puddles that come with the melting snow. It’s actually a lot of fun. I’ve been letting my son go crazy playing in them. It’s resulted in several clothes changes, but one happy kid. 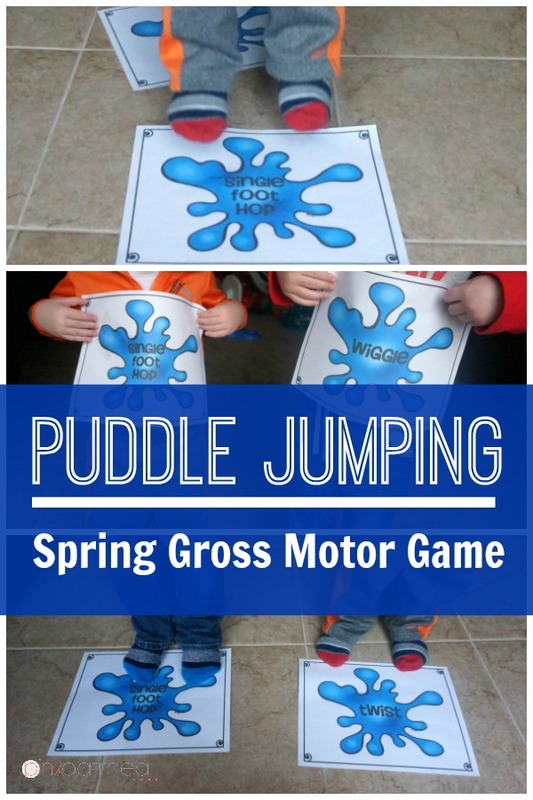 We’re planning on playing a puddle jumping gross motor game to get the kids moving this Spring. This game is fun for the classroom or at home. This game is similar to the St. Patrick’s Day Clover Hop that I played in March. It was a success so I thought we’d keep the fun coming with puddles. Now as great as it would be to jump in real puddles, we can’t always do that. If you can, go for it! Instead I created puddles for the kids to jump on. Let’s Play! 1. 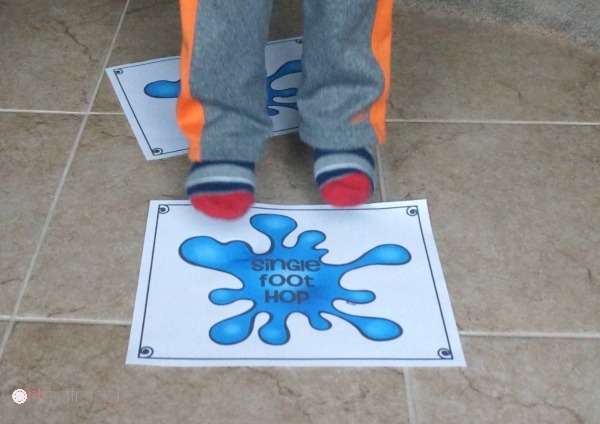 Lay puddles out on the floor with movement words and actions written (and now also pictured) on the puddles. Have the same amount of clovers as you do kids on the floor. 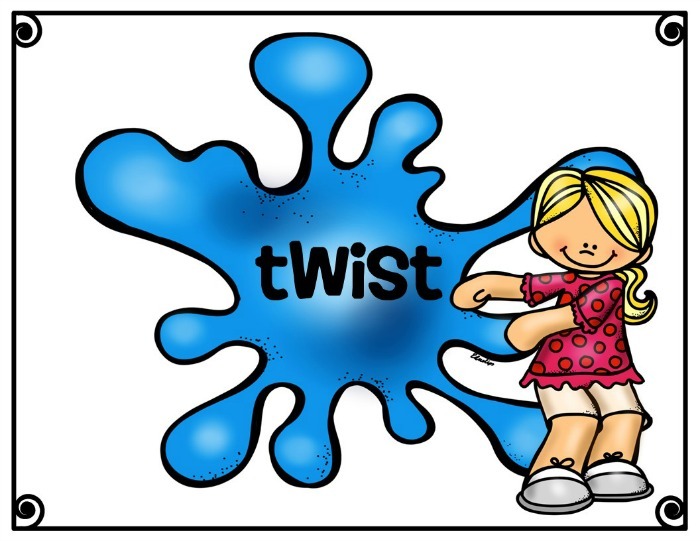 Get the puddles in the shop as part of the Spring Themed Brain Breaks, Yoga, and Games. Laminating is a good idea, that way you can use them again and again. 3. Turn on the music and let the puddle jumping begin. Have the kids jump from puddle to puddle while the music is playing. If walking works better for you it can be done that way too! 4. When the music stops have the kids perform the action written (and now also pictured) on their puddle. This can easily be modified to a musical chairs like game. Have one less puddle then students playing. When the music stops the student who is not on the puddle is out. Think about how great it would feel to have the puddle jumping game created and ready for you to use today? Feel confident your kids will love this game that incorporates physical activity! On top of that, no more searching the internet or trying to create resources on your own. 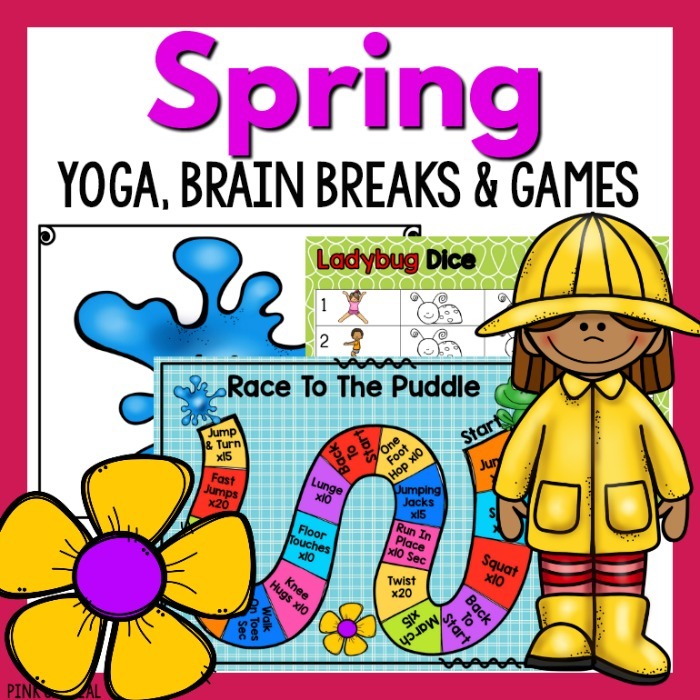 Save time, money, and effort when you purchase the Spring Yoga, Brain Breaks, and Games package and get everything you need for the puddle jump game and more!